On October 20th 2016 at about 1930 hours, Kalamazoo Public Safety Officer Brett Bylsma conducted a traffic stop in the area of Cobb and Mabel. During this stop a 49 year old resident of Plainwell was contacted and found to be in possession of crack cocaine. After this traffic stop Officer Bylsma continued his investigation into this matter and was able to determine who supplied the crack cocaine to the initial suspect. The crack cocaine dealer, a 27 year old resident of Kalamazoo was contacted a short time later and arrested in the 1100 block of Douglas. 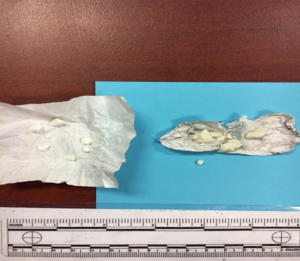 The suspect was found to be in possession of a digital scale and an additional quantity of crack cocaine (pictured below). This subject is currently being held at the Kalamazoo County Jail awaiting arraignment.